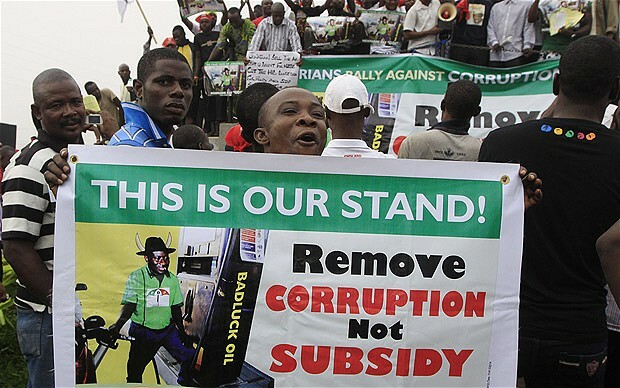 A national strike paralyzed much of Nigeria on Monday, with more than 10,000 demonstrators swarming its commercial capital to protest soaring fuel prices and decades of government corruption in the oil-rich country. Tensions flared at the American Licorice factory Monday as protesters associated with the Occupy Oakland movement joined the month-old factory workers’ strike, blocking entrances and turning away delivery trucks. Over five hundred people in the French city of Clermont-Ferrand attended the silent march on Saturday, to show their support for Wissam El-Yamini, a thirty years old man who went into coma following his violent arrest on New Year’s Eve. Tens of thousands demonstrating in Yemen’s capital Sanaa on Friday chanted “freedom to the detainees,” a slogan chosen by protest organizers for demonstrations in 18 cities across the impoverished nation. Around ten thousand people blocked railways and the Aswan-Cairo highway in the Upper Egyptian City of Nagaa-Hammadi, Qena, late on Friday, to protest the results of the ongoing parliamentary elections in their constituency. More than 20 Omanis continue their prison hunger strike, which began in mid-December, in protest at what they say are unfair sentences for taking part in demonstrations last year. In Turkey, police dispersed scores of anti-NATO activists in the southern city of Adana on Friday as they were setting up tents to stage a three-day hunger strike to show their opposition to the NATO missile system that will be established in the eastern province of Malatya. On Friday, thousands of shopkeepers in the Indian portion of Kashmir went on a daylong general strike to protest the killing of a student and frequent power cuts. A group of parents whose children attend Chicago Public Schools slated for “turnarounds,” closures or other adjustments protested the plan with a sit-in at City Hall Thursday, where they vowed to stay until Mayor Rahm Emanuel granted them a meeting to discuss alternatives. Dozens of street dance enthusiasts in Hangzhou, the capital of east China’s Zhejiang Province, participated in a flash mob activity advocating environmental protection last Tuesday.